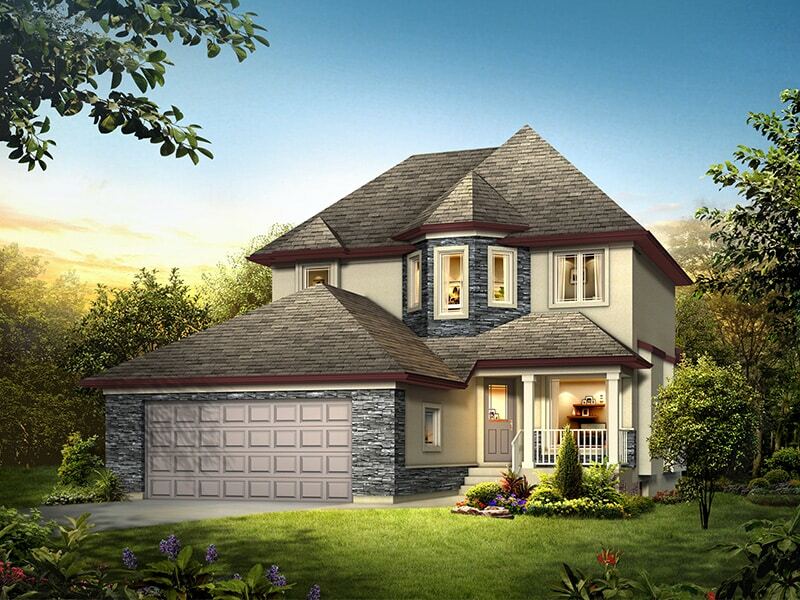 The New Castle II is a 3-bedroom, 2 1/2 bath home with 9′ ceilings. The glass paneled formal dining area, the large open-concept great room and the built-in fireplace allows for perfect entertaining. The kitchen boasts an 8′ custom granite island, walk-in pantry, custom oak cabinetry, tiled backsplashes and plenty of counter space. Oak hardwoods throughout the main floor and the enchanting staircase with chrome spindle railings leads you upstairs to the large master suite. The master bedroom features a deluxe ensuite with a 6′ drop-in jetted tub, stand-alone frameless glass shower, double vanity sinks and a large walk-in closet. The stone veneer and exterior trim detailing combined with an abundance of windows and the Victorian roof pitch makes this house a proven winner every time.